Siem Reap’s growing collection of quality tourism products, activities and services is triggering Cambodian inbound specialists to tap into the business events potential of the destination. 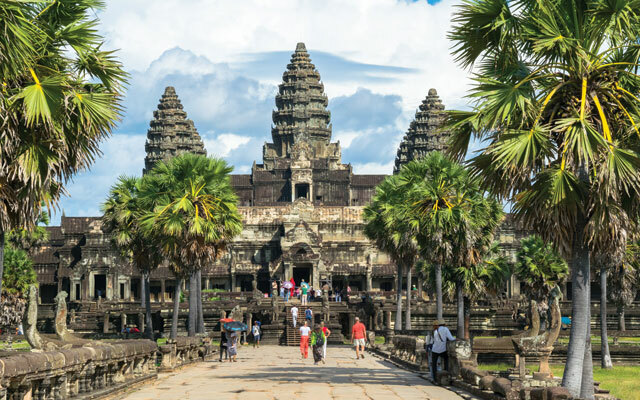 That, coupled with an intensifying corporate desire to seek out new destinations away from the traditional options of Thailand and Indonesia, are helping to plant Siem Reap on the corporate incentive map. Steve Lidgey, general manager of Travel Asia a la Carte, said 2018’s figures are on track to see a 20 per cent year-on-year improvement in business events performance, noting a “surprise” increase during the recent high season. He added the majority of business comes from MNCs based out of Singapore, Bangkok and Kuala Lumpur organising regional events and incentive trips for mostly Asian participants. David Baron, Angkor Golf Resort’s director of golf, has seen a 15 per cent hike in corporate bookings in 2018, with the 18-hole stand-alone golf course mainly serving groups from Singapore, Hong Kong, China and Japan. An increase in enquiries is coming from Thailand. The temples remain Siem Reap’s top draw, with many planners seeking to incorporate a visit to the historic structures into their agenda. However, more innovative temple experiences are being crafted, including boat trips on Angkorian ponds, picnics at remote jungle temples, and exclusive dining experiences overlooking ancient monuments. Sala Kdei is an elegant traditional wooden house that sits on the banks of the Sra Srang reservoir at Angkor. Jason Blackwell, director of marketing and sales, said the venue is increasingly catering to corporate groups of up to 150 pax seeking private dinners that feature traditional apsara shows, shadow puppet performances, and demonstrations of Khmer martial art bokator. Siem Reap’s abundance of natural beauty and increasingly improving accessibility are also driving more creative itineraries. Examples include private classes with performers at Phare, the Cambodian Circus, Vespa tours, candlelit dinners in the middle of paddies and new venues for cookery classes, such as the top-class kitchen at Mahob Farm that caters for groups of up to 30 in the heart of rural Siem Reap. Adrien Dennhardt, partner and managing director of Inspiration Cambodia, said the development of several five-star hotels on the coast of Sihanoukville has also helped bolster corporate incentive interest in Siem Reap, as he can now work on cross-country agendas. Cambodia’s competitive costs are also stimulating growth. The resort, which was the first in Siem Reap to organise exclusive dinners at the temples accompanied by apsara shows, is gearing up to open an additional ballroom-inspired events space for mid-size groups. However, challenges remain if Siem Reap is to reach its full potential. Ashley Lai, general manager of Courtyard by Marriott Siem Reap Resort – which opened in January 2018 – and is actively targeting corporate groups, said more direct flights are essential for the market to grow. Lidgey noted Siem Reap is still losing out on business to other destinations, including Bangkok, because of the lack of indoor activities and restaurants with high capacity. Dennhardt called for further improvements to roads and cleaner private and public areas, while pointing out that Siem Reap faces rising competition from emerging destinations, such as Sri Lanka and Myanmar, as well as established options like Vietnam which has waived visas for citizens of several European countries.